The lakes and ancient forests of Cavan, Ireland’s forgotten county, make a dramatic setting for the historic, 1,000-acre Bellamont Forest estate at Cootehill, 10 miles north-east of Cavan town, and 1¼ hours from Dublin airport via the newly-extended N3 motorway. Painstakingly restored by Australian John Coote, the jetsetting international designer of Classical 18th-century houses who bought the estate in 1987, Bellamont is for sale, with wonderful fishing and a pheasant shoot, at a guide price of €7.5 million (Correction: we printed £10 million in the article published on March 17, 2010) through Knight Frank Ireland (00 353 1 662 3255) and William Montgomery/Sotheby’s (028 4278 8666). Despite its historical importance as the first and most perfect Palladian villa built in Ireland, Bellamont House is relatively little known, whereas the Cootes, who built it, were very well known, not to say notorious, in their day. The first to make his mark in Ireland was Sir Charles Coote, a military adventurer who died in battle at Trim, Co Meath, in 1642, leaving estates in four counties to his four sons. His youngest son, Col Thomas Coote, was granted the O’Reilly lands in Co Cavan at the Act of Settlement in 1662. He married a Miss Hill from Hillsborough in Co Down and founded the town of Coote Hill (now Cootehill). On his death in 1671, his estate passed to his nephew, also Thomas Coote, who became a Lord Justice of the Kings Bench in Ireland, and was made a Knight of the Bath ‘in testimony of his good and laudable service in suppressing tumultuous and illegal insurrection in the northern parts of Ireland’. He also established Cootehill as a prosperous linen town, which, by 1800, was attracting buyers from Belfast, Dublin and London. On marrying his third wife, Ann Lovett, in 1697, Coote became the uncle-in-law of Sir Edward Lovett Pearce, a cousin of Vanbrugh, and by far the most important architect working in Ireland in the early 18th century. 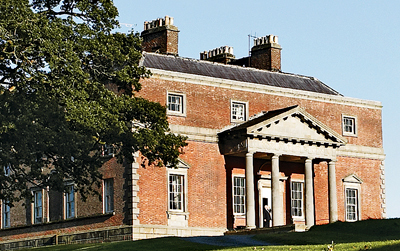 According to architectural historian Dr Maurice Craig (Country Life, May 21 and 28, 1964), it was Pearce who built Thomas Coote’s new house at Cootehill in 1729-30, the design of which was reputedly based on Palladio’s Villa Rotonda at Vicenza and Villa Pisani at Montagnana. Its name was later changed to Bellamont Forest by Coote’s grandson, Charles, who inherited in 1764 and became the Earl of Bellamont of the 2nd creation in 1767. The new Lord Bellamont was a complex figure, being variously described as a man of ‘the highest refinement’, but also as a ‘tyrant’, ‘madman’ and ‘a person of disgusting pomposity’. An inveterate womaniser, he sired at least six illegitimate children, all of whom were provided for in his will. On his death in 1800, the estate passed to these descendants who lived on at Bellamont Forest, becoming gradually ever poorer. In 1874, Edward Smith JP, having amassed a considerable fortune from the coal trade between Liverpool and Newry, bought the Bellamont house and lands for £145,000. Following his death in 1880, the estate passed through various members of his family until 1984, when the ‘troubles’ in the North finally persuaded the last of them to leave. Three years later, John Coote from Melbourne, the descendant of a Coote family member who had emigrated to Australia in the early 1900s, was visiting Ireland for the weekend. Discovering that the estate, by then in a sorry state of disrepair, was for sale again, he seized the chance to buy it. Twenty-three years on, Mr Coote’s three children have all returned to settle in Australia and, having completed the work of a lifetime at Bellamont Forest, he too is heading back Down Under. The restoration of the Bellamont estate, with its 400 acres of forest (let on a long lease to the Irish Forestry Comnmission), more than 500 acres of lakes dotted with tiny wooded islands, 18th-century parkland, and gem of a Palladian house, is a truly extraordinary achievement. Even more extra-ordinary, perhaps, is the fact that the house has remained virtually unaltered since Pearce’s day. Built of red brick with ashlar facings and a Doric limestone portico, the 11,350sq ft, two-storey main house has been re-roofed, rewired and replumbed, and an underfloor heating system has been installed on the lower ground floor. Double doors lead into the 25ft by 29ft saloon/ballroom, the most ornate room in the house with its splendid coffered ceiling. The drawing room and dining room are also richly ornamented. The other main reception room is the library, whose original flat ceiling was replaced by Lord Bellamont in 1775 with a more elaborate coved one, to match that of the dining room-the only serious alteration ever made to the house. In fact, apart from the installation of modern services, the only new thing about Bellamont Forest today is the furniture, all of which has been created by Mr Coote himself-based on original Irish Georgian designs-and is for sale with the house by separate negotiation. A stone staircase leads to the mezzanine floor, which houses a large bedroom with an en-suite bath, and an office, both of which have vaulted ceilings. The staircase continues up to the first-floor bedroom hall, and five first-floor bedrooms, all with en-suite bathrooms. Pearce’s spacious central bedroom hall, top-lit by a decorative elliptical lantern, was to become a typical feature of later Irish houses. A second staircase leads to the recently renovated basement, where much of the original stone-flag flooring and vaulted brick ceiling has also been restored. Here can be found the chef’s apartment, a large kitchen, a dining room, a media room and the wine cellar. The original servants’ tunnel links the basement with the landscaped walled garden to the rear of the house. The vast former linen hall has also been restored to provide five reception rooms and five bedrooms, all with bathrooms en-suite.